The 2008 Mustang Roush has several upgrade levels starting with hood scoop, spoiler, wheels, and badging in the V6 offering; to the Sport, Stage 1, Stage 2, and Stage 3 which adds upgrades all the way up to a 7 piece body kit and a 4.6L Roushcharged V8. Two popular special edition models are the 427-R and 428-R models which adds a 4 piece custom body, panels, graphics, wheels, interior, accents, and the 4.6L Roushcharged V8 engine. The 428-R engine starts with the Mustang H-code 300hp, 320ft-lb torque, 4.6L, V8: and adds a chrome powder coated Roushcharger; Billet radiator, oil, intercooler, and strut tower cap; and a performance exhaust system to raise the horsepower to 435 and 400 lb-ft of torque. Other Limited edition models include the 510hp P51A, the sporty Speedster, a racing suspension 427R Trak-Pak, and the midnight black only Stage 3 BlackJack. Grabber Orange 2008 Roush 428-R Mustang with a ROUSHcharger which gives 435 horsepower and 400 foot pounds of torque. This Roush model is based on the Roush 427R and stage-3 Mustang but has more power and production is limited to 200. This Performance White 2008 Roush supercharged Speedster is owned by Joe Jovanovich of Washington and was our Attitude Of The Week for the week starting July 17th, 2011. Joe's Speedster was one of our favorites at the 2011 Mustang Roundup held in Bellevue, Washington. Originally only one hundred 2008 Mustang Roush Speedster limited edition sport cars were to be built. Features include black top; black wheels; orange exterior graphics and stripes; Roush front fascia, chin spoiler, hood scoop and rear wing/spoiler; high flow grille; ROUSHcharger under the hood; and Roush custom interior to name a few. Torch Red 2008 Mustang Roush 427R Trak-Pak Stage3 coupe is designed for the daily driver who enjoys pushing his car to the limits on open track days. With the standard intercooled ROUSHcharger, the 427R Trak Pak Mustang has 435 horsepower and 400ft-lb. of torque. The cooling system has been enhanced with a black bar high flow front grille and radiator cooling shields. There is a functional strut tower brace under the hood to help strengthen the chassis and decrease unwanted twisting. The Roush 427R Trak Pak suspension includes adjustable front and rear shocks, front and rear springs, front and rear stabilization bars, front and rear jounce bumpers and adjustable camber/caster plates. Vapor 2008 Mustang Roush 428R Stage 3 coupe with a RoushCharged, 4.6 liter, V8 which is rated at 435hp and 400ft-lbs of torque. The 2008 Roush 428R Mustang is limited to 200 vehicles. Roush modifications include a Roush front fascia, chin spoiler, hood scoop and rear wing; functional locking hood pins; a black bar high-flow grille; Roush added performance front and rear shocks, front and rear springs, front and rear sway bars, jounce bumpers and an anti-wheel hop kit; Roush 18-inch cast wheels and high-performance tires; and a Roush custom interior. 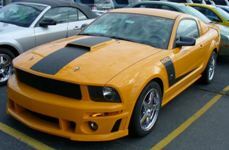 We've collected photos of other 2008 Roush Mustangs. Click here to see them with the help of our Detailed Picture Search loaded with year=2008 and model=Roush. Torch Red 2008 Roush Stage 3 Mustang coupe owned by Maureen from W. Monroe, New York. It has the 4.6L 300hp Supercharged V8 engine and a manual transmission. This is our featured Attitude Of The Week for the week starting January 20, 2013. Maureen tells us, "I have been hooked on Mustangs since the age of 10 when I saw a Grabber Blue Mach 1 parked in a driveway. I bought my first Mustang when I was 43, a V6 auto that I drove (summer only) for 5 years. My dream (since age 10) was to have a true Mustang muscle car. In 2009 I finally bought it. This brand new 2008 Roush Stage 3 Mustang. It's Roush supercharged and produces 430 horsepower with 400 lb. foot of torque. It is number 106 of 114 Stage 3s produced in 2008 and is one of only 12 Stage 3s built for 2008 in Torch Red with white rally stripes. I keep it spotless with several Meguiar's car products. The Stage 3 is nicknamed Roush's 'street legal race car.' This car commands attention where ever it goes or is parked. I attend local car cruises and shows with it during the summer. It's not the last Mustang I will ever own, but it will be with me for a long time. My sights are set on my next Mustang, a Boss 302, that will have a place in my garage right next to my awesome Roush!" Black 2008 Mustang Roush Black Jack Stage 3 coupe with Roush Black 7 Piece Aerobody Kit (front fascia, front chin spoiler, hood scoop, rocker panels, rear fascia valance and rear wing), Roush Black billet grille, Roush Black rear quarter window louvers, Roush black 18 inch forged chrome wheels, Roush Black fender badges, Roush Black Stage 3 decklid emblem, Roush BlackJack embroidered floor mats, Roush solid dark charcoal BlackJack sport leather seats, and Roush matte Black 21 inch wide custom striping. The 2008 Roush Black Jack is a limited edition of 100 cars (16 convertibles, 84 coupes). Vapor with blue stripes 2008 Mustang Roush 428R Stage 3 coupe with a 435hp, 400ft-lbs of torque, RoushCharged, 4.6 liter, 3 valve, V8 engine. The Roush 428R starts with a Mustang GT deluxe with a $195 driver ornamentation package (leather covered multi-function steering wheel with tilt adjustment, luxury trim alloy and leather on gearknob, and luxury trim alloy on gearknob), and $665 Shaker 500 audio system with 6 CD and MP3 player. Then add a Roush 4 piece aerobody kit (front fascia, front chin spoiler, hood scoop, and rear wing), a black bar high flow grille, a RoushCharger and other engine compartment enhancements, Roush wheels, a performance suspension, Roush interior upgrades, exterior stripes and graphics, and Roush badging. The is one of one hundred 2008 Mustang Roush Speedster limited edition sport cars. Speedster features and unique parts include: all white convertible with black cloth tops, all automatic transmissions (ROUSHcharger optional), unique black cast 18 inch wheels with polished lip, unique orange Speedster graphics on side rockers and hood, unique black leather seating with black suede inserts featuring the Speedster logo in orange and all other stitching in orange, black floor mats featuring the Speedster logo in orange, black decklid badge with orange Speedster logo, black and orange Roush fender badges, Speedster under hood serial badging, Roush front fascia, chin spoiler, hood scoop and rear wing/spoiler, high flow grille (from Roush Trak Pak model), Roush pedal kit, Roush windshield banner, Roush lowering springs with jounce bumpers, Roush convertible light bar, Roush door sill plates, Roush carbon fiber dash applique, and locking lug nuts. Optional equipment includes: Roush white face electro luminescent gauge cluster, Roush trunk tool kit, ROUSHcharger, Roush 14" front brake rotor w/four piston calipers kit, and Roush off road exhaust. Vista Blue 2008 Roush 428R Mustang coupe based on the Roush Stage3 with the Roush four piece body kit (front fascia, front chin spoiler, hood scoop, rear wing), Roush 18 inch cast chrome wheels and high performance tires, Roush braking system, Roush 427R white striping kit, Roush upgraded suspension system, and ROUSHcharged 4.6 liter powertrain system producing 435hp and 400ft-lbs of torque. Black 2008 Roush Black Jack Mustang convertible with the Roush Black seven piece Aerobody Kit (front fascia, front chin spoiler, hood scoop, rocker panels, rear fascia valance and rear wing), Roush black bar high flow front grille, lower valance fog lamps, 18 inch forged black wheels with performance tires, and a 4.6 liter RoushCharged V8 engine putting out 420hp and 400ft-lbs of torque. Vapor clearcoat metallic 2008 Roush P-51A limited edition Mustang coupe with a 510hp (510ft-lbs of torque), 4.6 liter, ROUSHcharged V8 engine. This is the most powerful Roush Mustang offering for 2008 and is limited to 151 cars. It comes with the Roush 4 piece aerodynamic body kit of a front fascia, front chin spoiler, hood scoop, and rear wing. It also comes with custom rear quarter window louvers, black bar high flow front grille, lower valance fog lamps, and Roush striping, graphics and badges. The special grille and fender red and yellow checkered badge is unique to the Roush P-51A.